August 8, 2017 -Springfield- Hampden District Attorney Anthony D. Gulluni announced today the arrest of ten individuals for their suspected involvement in a high level heroin trafficking operation here in Hampden County. In addition to the arrest, authorities seized six kilos of heroin, 4,500 ready-for-sale bags of heroin, six firearms, and four motor vehicles. The six kilos of un-milled heroin would conservatively yield over 450,000 bags of heroin on the street. In total 11 warrants were executed, 10 search and one arrest. On August 7, 2017, at approximately 6:30 a.m., agents from the Springfield Office of the United States Drug Enforcement Administration (DEA), Troopers from the Massachusetts State Police Detective Unit (MSPDU) assigned to the Hampden District Attorney’s Office, the Springfield Police Department Narcotics Unit, the Federal Bureau of Investigation Gang Task Force, the Massachusetts State Police Violent Fugitive Apprehension Section, and agents from both the Bureau of Alcohol Tobacco Firearms and Explosives and Internal Revenue Service, executed four simultaneous search warrants at various locations throughout the city of Springfield. In addition to the four search warrants for these residences there were six separate search warrants for motor vehicles and one arrest warrant issued. These raids were the result of an extensive investigation conducted over the last several months into a large scale heroin trafficking organization by the Springfield Office of the DEA and Troopers from the Hampden County MSPDU assigned to the Hamden DA’s Office. This investigation was the result of extensive intelligence gathering which provided invaluable information throughout the course of this investigation. The investigation identified 57-59 Sterling Street as being one on the primary targets, Josue Pujols, home residence. 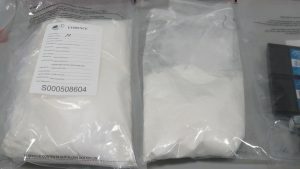 The subsequent search revealed approximately 1.5 oz of uncut heroin, four shotguns, two loaded handguns and multiple baggies, grinders and packaging materials consistent with a small mill. This residence has also been identified as housing the heroin mill workers at times during the course of this investigation. The organization’s heroin mill was located at 73 Cherrelynn Street. 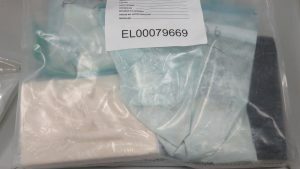 The subsequent search of this residence recovered what is believed to be in excess of six kilos of raw heroin and when packaged for retail sale have a conservative value of $1,350,000. 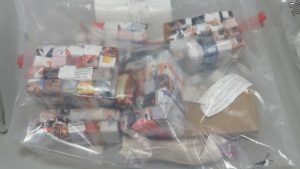 Also recovered: 4,500 wax baggies of heroin packaged for retail distribution, and a mill set-up including: packaging, cutting agents, baggies, stamps and grinders that could accommodate 6-8 mill workers. 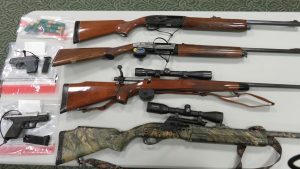 The following persons were arrested at 57-59 Sterling Street: Astrun Pujols, 27, of New York, NY, charged with Possession of a Firearm without a License, Miguel Sanchez, 24, of Springfield, charged with Possession of a Firearm without a License, Josue Pujols, 30, of Fresh Meadows, NY, charged with three counts of Possession of a Firearm without a License, and Trafficking Heroin 18-36 grams. The following individuals are being charged with trafficking in heroin over 200 grams for the seizure at 73 Cherrelyn Street: Elvis Pujols, 27, Springfield, Harlem Ciprian, 22, Springfield, Yankey Ciprian, 19, Queens, NY, Edward Ciprian, 23, Queens, NY, Franky Mosquea, 22, Queens, NY, Richard Ciprian, 20, Bronx, NY. The final arrest was also the target of this operation and was the subject of the arrest warrant, Fausto Pujols, 28, of Springfield. He was arrested at an unrelated fifth location by the Massachusetts State Police Violent Fugitive Apprehension Section for conspiracy to violate drug laws and heroin distribution in the city of Springfield. He is believed to have orchestrated the milling operation at 73 Cherrelyn Street. He was also subsequently charged with trafficking in heroin over 200 grams. Hampden Distrct Attorney Anthony D. Gulluni stated, “I would like to thank the dedicated and professional members of law enforcement who participated in this investigation. This was a high-level and sophisticated operation that was supplying this area with heroin. The streets and neighborhoods here in Hampden County are appreciably safer today with these individuals in custody. This is an on-going investigation.